Neighborhood residents and Audubon Charter School parents got a first look Tuesday night at plans for the school’s proposed temporary campus in the Lower Garden District and began voicing concerns about the safety of the neighborhood, before a sudden downpour flooded the area and forced an early end to the meeting. 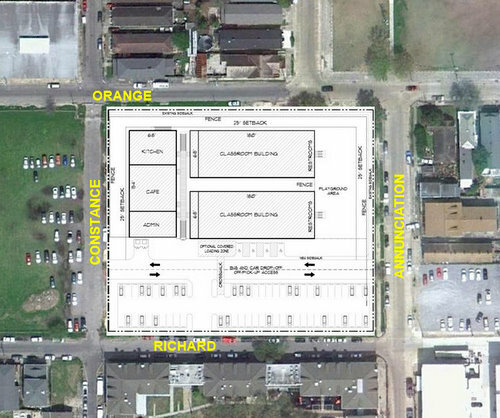 The school is proposed for a vacant lot bounded by Orange, Constance, Annunciation and Richard streets. 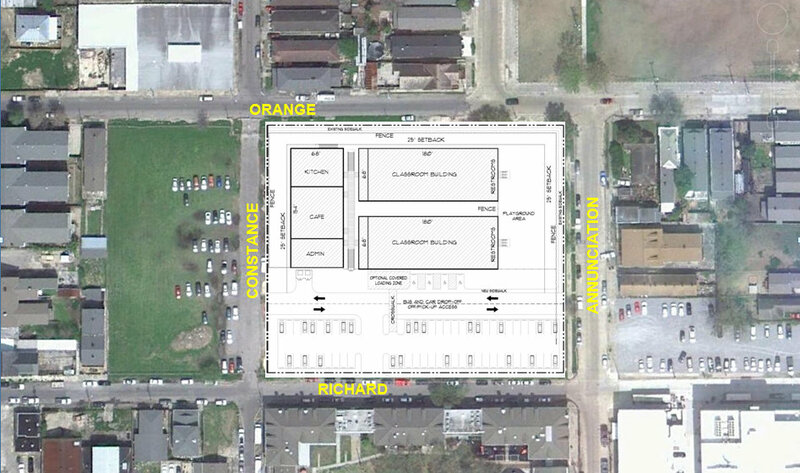 According to plans shown by project management firm Jacobs/CSRS during a Tuesday evening meeting at the nearby Sixth Baptist Church, the site would essentially comprise three similarly sized buildilngs, a playground and a parking lot. The cafeteria and administrative building would run along Constance, one class building would run along Orange, and the second class building would sit next to the first near the center of the lot. Engineers are proposing a drive to be added through the center of the lot from Annunciation to Constance, and partially reopening Constance, which is now closed there. Parking would be in a lot near Richard and the playground would be along Annunciation, though when one audience member suggested reconfiguring the site to move the playground closer to other fields nearby, Jules Lagarde of Jacobs/CSRS promised to try that design. After the plans were introduced, no objections outright to the school were voiced by neighborhood residents, though some offered suggestions about traffic flow and parking issues in the area. Audubon parents, however, expressed some concerns about the safety of the neighborhood. The site is a block away from the River Garden development that replaced the old St. Thomas housing projects, and nearby Felicity Street was the site of a drive-by shooting in February that killed one man and injured four other people in the mid-day crossfire, including a 3-month-old child. “What would make this acceptable?” Lagarde asked him. “The security,” the man replied. “We’re going to make the security acceptable,” Lagarde assured him. “Some parents are not going to be willing to say they’re uncomfortable with it, but they’re going to vote with their feet,” the parent replied. Audubon principal Janice Dupuy said school officials have faith that the Orleans Parish School Board and the project managers find a solution that ensures the students’ safety. At another parent’s questioning, Lagarde began explaining the project’s timeline, which will include seeking the city’s permission to use the lot for a school. While Lagarde spoke, however, flooding from Tuesday evening’s storm brought the water so high in Felicity Street outside the church that officials suddenly decided to end the meeting immediately, and the nearly 40 attendees all fled the building at once. To read a full recap of our live coverage of the meeting, click “replay” in the box below. The park adjacent to the proposed location of Audubon Charter School is loaded with toxins and is currently closed to the public. The site for the school should be tested for as many toxins as possible and remediated if necessary before placement of the portables. If this is not possible the school should be relocated to a safe site. Thanks for your comment. I just got off the phone with Jules Lagarde, and he said he has yet to see the results of the soil testing today but reiterated that a any remediation plan necessary will be developed publicly. He also noted last night that they have hired the same scientists to test the soil that discovered the contamination at Annunciation Park, so they are aware of the issues there. Thanks again for your thoughts. We’ll publish the results of the soil testing as soon as we receive them. What is the purpose of the temporary site? What’s being done to the old Audubon? Oh good! I went to audobon as a child in the 80’s it’s literally the only childhood building still standing or in working order. I lived at 2922 General Pershing, which was bought out from k&b which then was a rite aid, we moved across the street to 2929 General Pershing, which is now a Popeyes. Gert Town pool where I learned to swim is in shambles. Good news to know that at least something has been given life after Katrina. My son goes to school about 3 blocks away. I bike him through river gardens and right past this site every morning and many afternoons. We’ve never had a problem. It is a lovely neighborhood filled with families and kids. You may want to consider one of our garden systems to add a bit of green to the campus. Our systems can be built on blacktop/cement and since they sit on the surface, can be moved to the permanent campus once it is in place. We also use raised beds and bring in healthy soil so there is no issue regarding the native soil. We built a garden at Langston Hughes Academy in New Orleans if you want to see what our garden system looks like in person. As a neighbor who could not attend due to the flooding, I am in objection to the increased traffic load at he Richard/Annunciation intersection. It is already known to contribute to accidents with serious injury, and a four way stop would be absolutely vital there. The movie studio has provided off street parking, but vehicles entering/exiting their lot just 30 yards from the school’s off loading in the middle of the block on Annunciation would be absolutely insane. We are also in opposition to the use of a gravel parking lot as proposed by CSRS/Jacobs. This is not legal and it is a direct contributing factor to the flooding that ended the meeting with the public. We already have two gravel parking lots that have blocked more than 50% of the culverts on the block. Please also consider St. Michael’s traffic load just one block away and how this is already a contributing factor to the vehicular issues in the area. In terms of safety, yes, we have many families in the neighborhood and I raise my sone on the block, but we do have frequent shootings within a vicinity that would cause a lockdown of this school every two to four weeks. I do not think that is acceptable, but that is why I pay for my son to go to a private school uptown. If these parents want to whine about safety in my neighborhood, then stay uptown. I could do without the additional trouble, and having grown up uptown, I frankly moved here to get away from the attitude of entitlement that is pervasive uptown. My neighbors are good people, even is some of them are poor as dirt.